As the late Soho dandy Sebastian Horsley once observed, it's essential to piss off the right people in life. 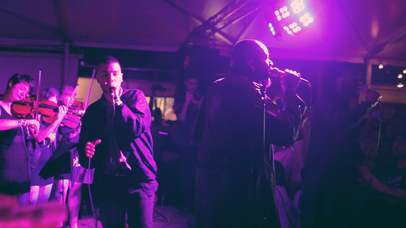 Young Fathers may not have intended to annoy a sizable section of London's music hacks following their Mercury win in October, but it's unlikely they're bothered. The Leith-based trio have enjoyed an extraordinary year following the release of their dazzling full-length debut album, DEAD, which has seen their international profile soar. But when Nick Grimshaw announced the band as winners of the Mercury Prize at Camden's Roundhouse, there was – judging by some of the debate that subsequently appeared online and in print – a sense of bafflement among some music industry observers. While it's par for the course that an outsider wins at this event, it's usually an act based in or around London who's already on speaking terms with media pundits. The technicolor, bass-heavy sound created by Alloysious Massaquoi, Kayus Bankole and G Hasting has been variously described as like De La Soul, Method Man or a psychedelic boy band throughout Young Fathers' various incarnations thus far. Whichever genre-based sloganeering you want to slap on its back, DEAD was a worthy winner. But in the aftermath of their win, the major talking point was not this stand-out record but the fact the group had chosen not to speak to several correspondents representing right-of-centre tabloid newspapers. "Life is a compromise and especially in the music business," explains Massaquoi. "But if you find yourself in any given situation where you don't have to make a compromise then don't. It's as simple as that. As a group we have a knack for learning and putting ourselves in uncomfortable situations over and over again. So much so it becomes normalised. Whether it be in creating the music, performances or in a media circus." 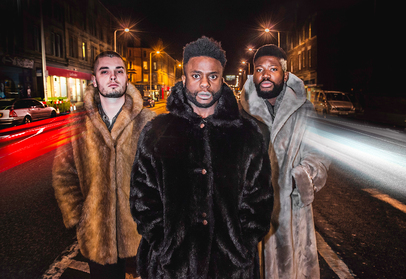 Young Fathers have yet to decide how to spend their £20,000 prize money – "the cheque is still lying around" – but they gained most satisfaction from their performance on the night. "We were recording in the studio at the time and our manager mentioned it briefly to us that we had been nominated," Massaquoi continues. "We were like 'That's good... now let's get back to recording.' After winning the award the mood was the same – it was definitely a positive thing for the group as more people will tune in to us. But the main focus throughout was the performance. We came across well and that was it. End of." The group made no bones about their desire to become popular when we spoke to them ahead of the record's release in January. Ten months on, there's still an understated sense of urgency in the camp. "You get there when you get there," Massaquoi says now. "Creative people are never satisfied." Young Fathers are currently in Berlin to record the follow-up LP to DEAD. "It's going well. Once everything is done we can get a better perspective on it. There will be an album release in the early part of next year." Such is their relentless work ethic, new music is already starting to emerge as The Skinny goes to press. What more can expect from the trio in 2015? "The crossover album. A UK/American tour, and parts of Africa too. More interviews and more work." Their work is finally being rewarded, perhaps, but Young Fathers remain unwaveringly occupied by the task at hand.